A cloud of dust billows up as the rickety state run bus leaves the bus stop. One hour back, en route to Bangalore from Srirangapatnam, Michelle, Nisha and I, spontaneously decided to get down at Channapatna – the land of toys. We head to the auto-rickshaw stand and hail a vehicle towards the toy factories. Although a couple of hours away, the weather here is sunny, hot and humid – a stark contrast to the cold and cloudy skies of Bangalore. A ten-minute bumpy ride later, we are on Tatekere Road, searching for a factory, hoping to see how these famous toys are made. The street is lined with small vegetable shops, vehicle repair workshops and small brick houses washed in bright colours. Halfway through the narrow lane, we spot a maroon board with Lacquerware Craft Complex painted on it in white. “Yes,” this time we say, unanimously. The soft droopy eyed Munner Pasha who heartily indulged all the information on this article. We make our way across heaps of cut wood piled up on the floor to Muneer Pasha – a middle aged man, with thin graying hair and mustache, sitting precariously atop a wooden stool, working on a piece of wood attached to his workstation. Wearing a white sleeveless vest and a pair of sawdust covered trousers, he stops and looks up with his droopy eyes, as we greet him. His workstation is a muddle of wood chips, sawdust, and tools. 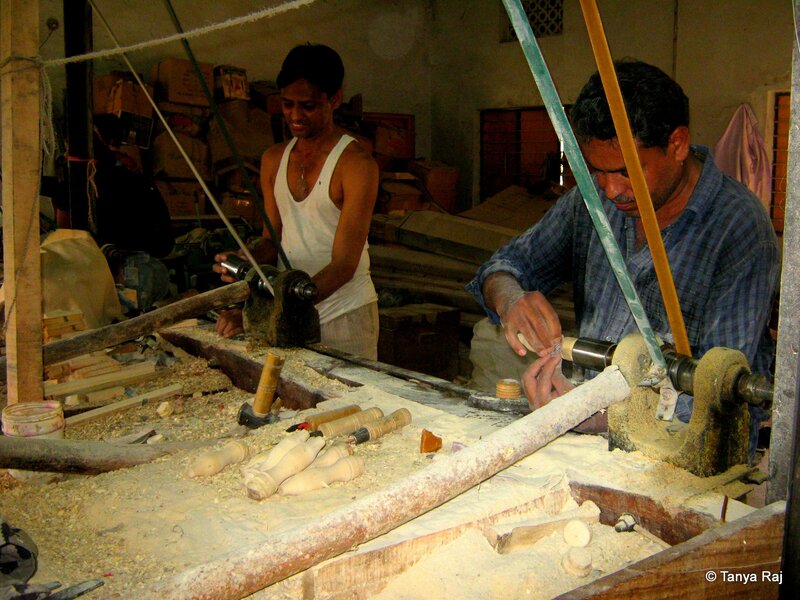 “We use either Milk Wood or Ivory Wood to shape the toy parts. Lac is mixed with different vegetable dyes to give natural colour and then pressed onto the wood before polishing it with lac polish and print paper. All the designs are carved after that. Sometimes designs are also hand painted by us,” he informs, “let me show you a sample,” and starts to make a toy part. 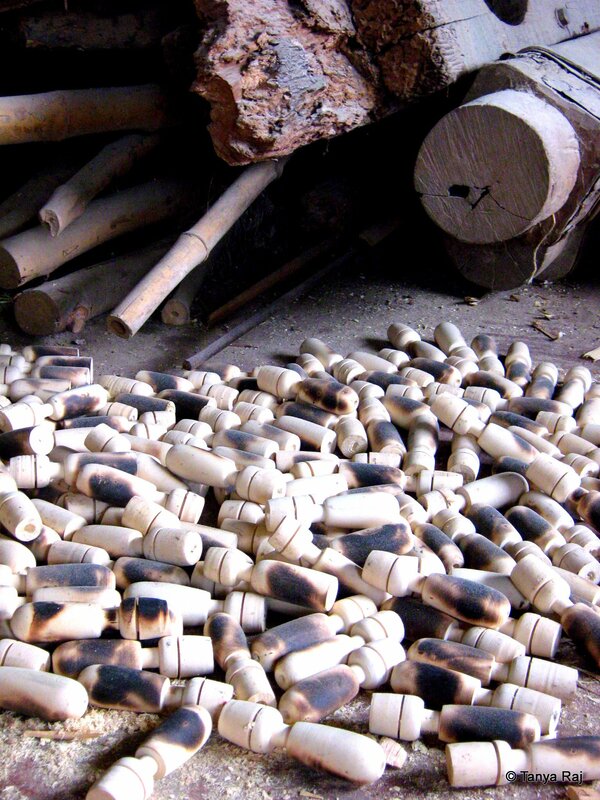 Piles of raw milk wood which are used to craft out the exquisite toys. His calloused hands reach for a piece of raw wood and work swiftly on the machine as he shapes it into a perfect round piece with his chipping tool. Next, he takes a stick of coloured lac and presses it against the soft white wood, effectively turning it black and then with a piece of print paper polishes the piece. He draws a sharp pointed tool and with a swift motion carves two concentric rings before cutting out the finished piece from the raw part. Within a matter of minutes, a perfect piece of wooden craft is ready. 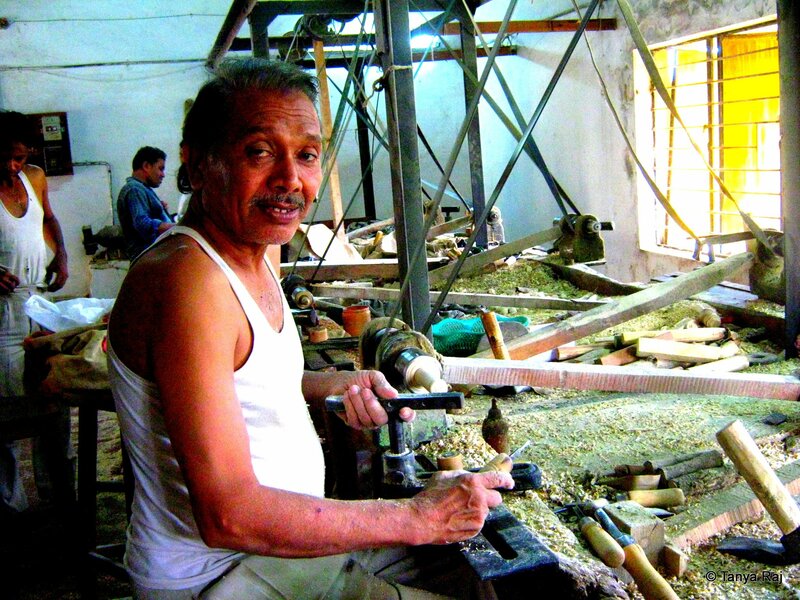 These artisans have been diligently working on these factory floor for generations. “It is not just toys, we also make key chains, bangles, bracelets, hair accessories, even napkin holders and coasters,” he tells us as he starts to fish into a gunny sack next to him and pulls out a handful of key chains with smiling faces painted on small round wooden surfaces. Seeing him, the other artisans also reach out for their respective wares and we are suddenly surrounded with a mélange of colourful knick-knacks of everyday use. They encourage us to buy a few things and we realise that the prices they are quoting are half of what we get in Bangalore. We indulge in a small shopping spree in that tin roofed factory. These colourful napkin holders have been hand painted by the artisans. Their enthusiasm and pride in their art are almost infectious. However, I can’t help but notice the mediocre conditions they work in and still churn out hundreds of toys every day that brings so much joy to children. Conditions today are definitely much better than the earlier generations that have worked on the same factory floors, but their eagerness to make a sale, also tells a tale of wages that are nowhere close to the exquisite art that they are masters of. After half an hour tour of the factory with these warm-hearted and welcoming artisans, we make our way back to the bus station with our bags filled with handcrafted wooden painted trinkets.